In this post, I talked you through on how our hair washing routine affects our curls and I mentioned that The Curly Girl method is the better alternative. So what exactly is CG method? Let’s walk through the basics. There is a universe of information on the basics (as well as details) of the Curly Girl method on the internet. So here goes the short (and sweet) summary. 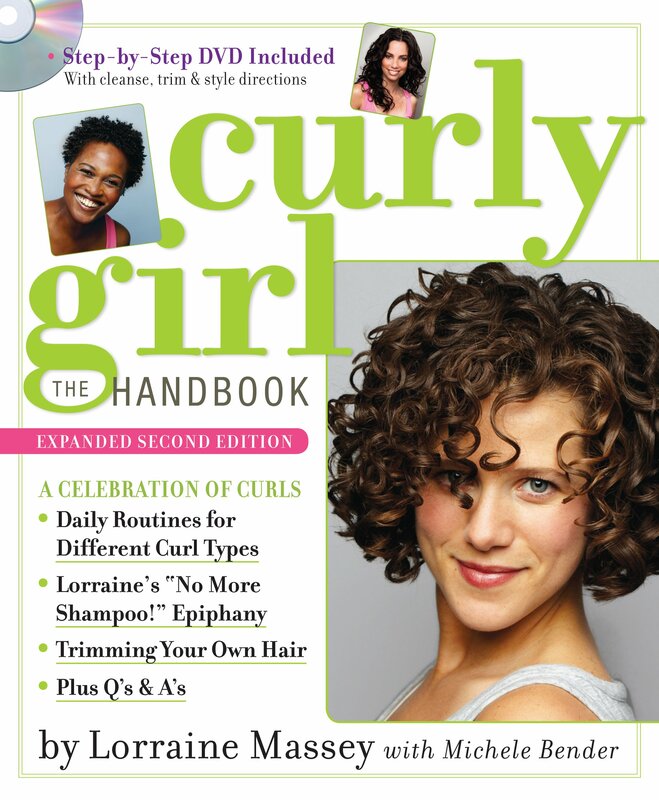 The Curly Girl Method was introduced by Lorraine Massey in her book called ‘Curly Girl: The Handbook’ (pic shown below) in the year 2002 and then an updated edition came out in 2011. Well back in 2002 I was not even aware of anything called Curly Girl. Frankly, until 2013 I had no idea. Even after that it took me so long to decide to take the plunge. I strongly regret the delay and I wish no other curly/wavy Indian gal gets delayed any further. The Deva behind this awesome innovative method, Lorraine Massey, shook the basic hair care and wash routine and replaced it with a completely new one for the benefit of curls and waves. In her book she introduced a totally new way of taking care of our curls. I am giving a snapshot of the CG method here. Hope it helps. Stop using sulfate shampoo for washing your hair as most shampoos contain sulfates which are extremely drying for the hair. Use a silicone-free conditioner (preferably a botanical one) or a sulfate – free shampoo instead to wash the scalp. Washing a conditioner to wash hair is called ‘Co-washing’ or ‘Conditioner only wash’. While hair is soaking wet, apply generous amount of conditioner and detangle hair using fingers or a wide toothed comb and part your hair as required. Gently squeeze your hair towards the scalp. Rinse off the conditioner. You can also use same silicone-free conditioner as a leave-in conditioner or leave a little bit in the hair while you rinse out in step 4. Do not rub your hair with a towel. Let hair air dry or use hair diffuser and never blow dry. Once the hair is 100% dry (or say 110% :p), scrunch it towards the roots to remove any crunchy feel of the gel and to enhance the curls. Know your Curly Hair Wash Routine! What is your Curly Hair Type? Hi, I have dry hair and I want to follow this method. What do you do on the next day of washing..after waking up. Tangles in hair etc. Without brushing combing how to go out? It’s great that you are planning to follow this method!! 🙂 I have a post lined up regarding the same. Done! your curls would look refreshed and the conditioner would control the frizz. Thanks for the reply. I just stumbled on CG method and I am absolutely fascinated by it. My hair is more like 1c or 2a but when I colour my hair they become 2c extra curly. With thyroid issues the hair became very dry and frizzy. I can see that using brush is a total no no on dry hair. I didn’t convert completely to CG but I am using one tip at a time to see what works and what doesn’t. Also I bought big tubs of shampoo and conditioner for coloured hair which has all the sulphates and silicones. They are expensive so I will finish them. You have explained everything really well and I am very happy that I found your blog. I can understand the problem of having huge tubs of expensive hair products going waste 🙁 I hope those get over soon and you get to try out Curly Girl Method at the earliest! Till then may be start using frequent oiling and deep conditioning treatments….so that the dryness and frizz are atleast started to reduce. Also, the changes in curl pattern can also be because of thyroid issues. I hope you have already consulted a doctor and are keeping thyroid under control. If you are following partial CG or one step at a time, do read this post. There is one point regarding partial CG following. Hi, I have curly plus wavy medium length hair ( goes down till the Length of my bra strap) ….i have frizzy hair which seem very dull after head wash….my roots are oily(leading to oily scalp) bt the ends n midshaft is significantly dry……i have been using tresemme fr long and then chanced upon ur blog….I am curious to know whether co-washing and mousse are good fr oily scalp ? Also sunsilk captivating curls range has good reviews fr all its 4 products….so should we try those? Cowashing is fine for oily hair, however, if you are using sulfate containing shampoos(which all tresemme shampoos in India have) then it is better to move to a sulfate free shampoo first and then to co-washing. Since directly shifting to Cowashing from sulfates might give a shock to the scalp! Sunsilk Captivating Curls range I have not come across. I would rather look into the ingredients and if those are silicone free then can surely give a try. If contains silicone then I will give it a pass. Thanks for the reply….. I also wanted to ask since I want to grow my hair long which oil should I use and do the SLS free shampoos effectively remove the oil from hair, these being mild in nature? P.S. : I have oily scalp nd any oil residue makes my hair sticky within few hours of head wash.
Sulfate free shampoos are efficient in removing oil from scalp. But since you are using sulfate shampoos(which can also be one of the reasons for the scalp being oily! ), when you shift to sulfate-free ones, the scalp might take few days/weeks to get adjusted to the new mild shampoo and to accordingly produce less oil. But once its set, scalp’s oiliness reduces and I have seen this personally. 3rd day post wash, my scalp used to feel as if I have applied oil!! but now it doesn’t get that oily. For hair growth, castor oil mixed with other lighter oils is considered best. but since you already have oily scalp, I would suggest adding few drops of pure peppermint essential oil with a lighter oil like olive/almond or even coconut oil and massaging the scalp either leave overnight or atleast 30mins before wash. Also, dry massage your scalp every night to regulate blood flow and increase hair growth. Oh ya Biotique doesn’t mention all ingredients…. oh btw… forgot to mention… try and get coldpressed oils and virgin/extra virgin instead of the normal ones whenever possible. Inspired by you I Recently started with the CG method with Giovanni smooth as silk organic shampoo and loreal intense smoothening conditioner…..and am pretty excited about it as well…I recently met a friend who recommended me shampoos and conditioners by” bblunt ” ….can you please throw more light on the products of this brand! Oh Delhi heat, I know…and summers can make it tough to leave hair open. You can try doing messy buns, half up half down hair styles. Twist front pieces and pin then at back, braid front parts, either leave rest of the hair open or toe them up in a pony or side pony. These are few that work for me. Today is my third wash following CG method…but in all these three washes I’ve had major hair fall!! It really scares me seeing whirls of hair on my drain post head wash *sad* n *scared*…… it’s really bugging me since I’ve Neva had this much hair fall b4.. is it the method dats nt suiting me or is it my wrong approach? What if I use a sulphate shampoo with a non silicone conditioner? Will that work coz u feel the shampoo ( Giovanni smooth as silk) is nt fr me. *sad?!?! Oh my,,, Meera… you sound so freaked out!! Umm okay so hair fall in 3 washes, right? There can be few reasons. You have shifted to a sulfate free shampoo and silicone free conditioner right? How many days gap between each wash?? 1. Hair fall of about approx 100 or so strands per day is normal. Usually we brush or comb out our hair daily so these naturally fallen hair are removed daily. But when we style curly, max of the hair strands that have fallen off between two washes come off all together during hair wash when we detangle. So instead of the daily 100 strands we see 400 strands on 4th day of wash so this startles us. It is pretty natural to feel that more hair is falling than usual. But in reality, it is the same amount of hair fall that we had earlier. 2. When we change to a new product, some times our hair takes time to adapt to the new product. Sometimes we see little increased hair fall, increased oil production etc. for few initial uses. And scalp will settle down after few uses. I personally feel that you should give it a little more time,say 2 months on the whole? And I am sure it would not be this bad and you can make out better if it is actually having a bad effect on your scalp. Using a sulfate shampoo with non silicone shampoo will be fine only. But what’s the point if at each wash your hair is extremely dried out and stripped of all the moisture that we provide. My suggestion is to continue for few more weeks and then we can revisit this plan of what regimen to follow…what say? Till then keep in touch and I will try to help out in any other way. Thnx fr the reassurance divya….. I’ll surely stick with this fr a month or so…hoping to see good results……btw I’ve started falling in love with my curls..n probably people around are aslo admiring them *happy* *dancing*…. Great to know that you planning to stick with this. I am cent percent sure that it will work out for you!! Hi Divya. I have read through almost all your post and it has been really informative and i just love your curls. I am new to cg method and is using the giovanni silk as smooth conditioner and thought of using the Co wash technique to begin with. I just have a query. How often do you wash your hair? If daily, how? I mean do u shampoo it daily? Hey Greeshma, I do not wash daily.. I wash my hair every 3rd day…I shampoo it…Sometimes I alternate cowash and shampoo…every 3rd day.